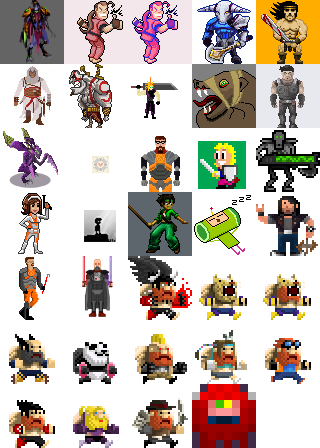 Here is a collage of the entries for competition A.
I'm missing some (particularly FemShep, Star Wars Old Republic & Tekken) because they weren't the required 64x64 size. If those artist could please correct their work and let me know then I'll add them to the collage. If these aren't your final pics, I took the wrong image or you want to resize larger up to 64x64, let me know and I'll update it. Remember that the competition closed yesterday 31 October 2012. At 23 entries I think we've had great participation! Well done everyone! Maybe zoom it to 64x64? Here is my entry 34 x 64. Star Wars Old Republic and Eddie have been updated. @aodendaal I'm not entirely sure, I thought they were entries (if just for humour) but I might be wrong. I guess that's up to the creators. Cacodemons are never just for fun (smiley face).